What a day!! The ups and downs of any competition is filled with “The thrill of victory and the agony of defeat” as the saying goes. 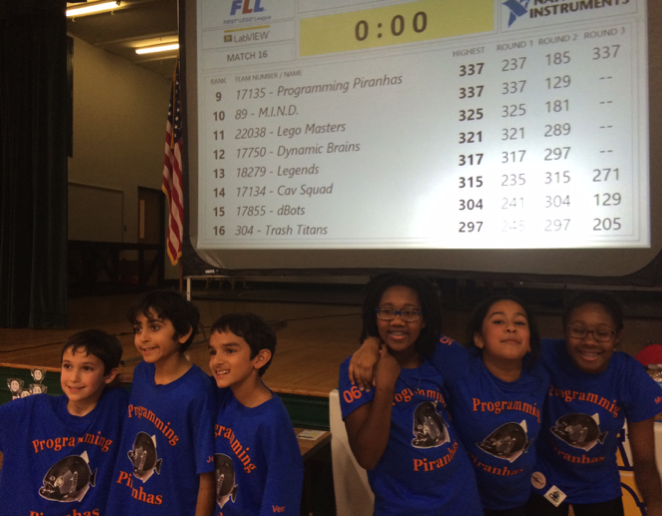 All 3 teams had strong showings but only the Programming Piranhas advanced to the state tournament on January 23, 2016 in Greensboro, NC. More information at http://ncfll.wildapricot.org/state The image above shows them standing in front of the scores being posted. Their last robot run was wonderful and earned the high score of 337 which had them in 9th place. The Robosharks were in 5th place at this time with the Cav Squad being in 14th. As the final scores were posted the teams moved a bit in the rankings. It was only after the judging was added in for Core Values and Innovative Project that the Programming Piranhas secured their spot while the other teams were left wondering where they could improve for next year. The robot competition is only 1/3 of the competition so teams that showed any weakness in the other areas had a hard time making it to the state tournament. I am very proud of all the teams who worked hard over the last 3+ months. Go Programming Piranhas!